Many abdominal symptoms like abdominal pain, abdominal cramps, diarrhea and constipation as well as non-intestinal complaints such as headaches, diz ziness, rashes, runny or blocked nose, fatigue, lightheadedness, watery eyes and other symptoms can be attributed to the diet or individual foods. The identification of food related symptoms is usually difficult since we consume various foods during the course of a day. 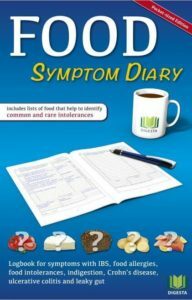 Dieticians, medical practitioners and professional societies recommend using a professional food-symptom diary that logs food intake, amounts consumed and type of preparation as well as symptoms, symptom intensity and type of bowel movements (diarrhea, soft, normal, hard, none). Such a log helps you to determine individual intolerances to foods or food ingredients. The diary is kept small in size to allow you to carry it with you wherever you go. It is important that your diary accompanies you all the time to allow you to log all important information whenever food intake or symptoms happen.